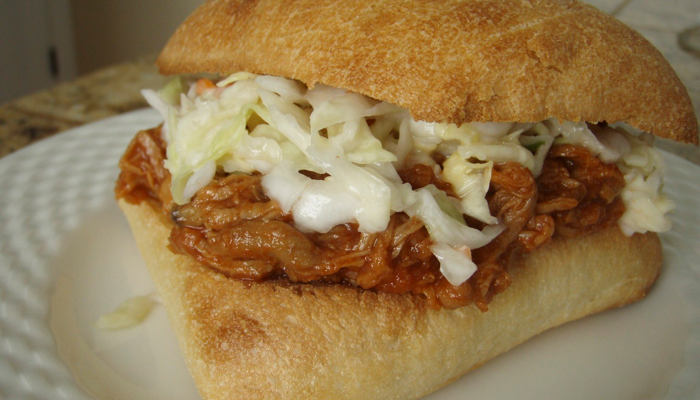 Pulled Pork is one of my favorites because it’s quick and easy to prepare and you can scale it up if you want to make a bunch. I always make this in my 5 quart slow cooker. Combine the ketchup, brown sugar, vinegar, Worcestershire sauce, mustard and pepper. Pour over pork. Cover and cook 4-5 hours on low or until meat is tender. Remove meat and shred with two forks. Return to the slow cooker; heat through and set the slow cooker on ‘keep warm’. I serve this over sliced toasted cibatta topped with cole slaw.